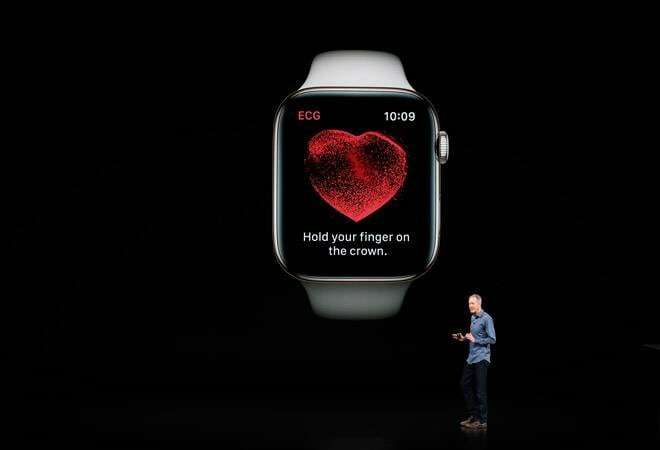 Jeff Williams, Apple's chief operating officer, explains, "We've added electrodes to the back of the Watch, and the digital crown allows you to take an electrocardiogram. Now you can take an ECG anytime, anywhere. You open the app and put finger on the digital crown. Built-in electrodes on the back and crown detect electrical impulses from your heartbeat and it will send them to S4 chip. Takes 30 seconds, and then you get a heart rate analysis." All ECG recordings will be stored in Health app. Since the launch of Apple Watch in 2015, it had a heart-rate monitor built-in. Over the years, it has identified and notified users about the escalated resting heart rate, resulting in saving a few lives. Apple Watch has received a major design overhaul. It features larger, edge to edge display with rounded edges and is 30 per cent bigger, making space for more information to appear on the display. Even though bigger in size, the older generation watch bands will be compatible with the new ones. The Digital Crown now includes haptic feedback, offering a more mechanical and responsive feel through the sensation of incremental clicks. The back of Apple Watch Series 4 is made using a black ceramic and sapphire crystal, allowing radio waves to easily pass through the front and back for better cellular service. Apple Watch Series 4 includes a new dual-core 64-bit S4 processor that the company claims will offer two times better performance. Other hardware improvements include an updated accelerometer and gyroscope for all-day activity tracking and identifying swim stroke. The new Watch runs Apple's watchOS 5, which brings powerful activity and communication feature onboard. The Activity Sharing competitions allow Apple Watch owners to enter into a seven-day Activity competition, earning points for closing Activity Rings, while receiving coaching notifications to help stay engaged and win the week. One of the much-awaited features is the auto-workout detection that provides an alert to start the correct workout and gives retroactive credit. This feature also offers a reminder to end workout sessions after a period of inactivity if the user forgets. The New Running feature includes a new cadence (steps per minute) metric for indoor and outdoor runs and walks, as well as a new pace alarm for outdoor runs that alerts users when they are behind or ahead of their designated target pace. Walkie-Talkie facilitates a new way to communicate with voice and just a tap of the wrist. Along with the new Siri Watch face, watchOS 5 will bring the ability to listen to podcasts on the go. Apple Watch Series 4 will be available in new gold stainless steel model, joining silver and space black stainless steel models, and will ship starting September 21 in a select few countries. The GPS variant of the watch will retail from $399 and the LTE variant will retail for $499. Apple will continue to sell the Apple Watch Series 3 for $279.